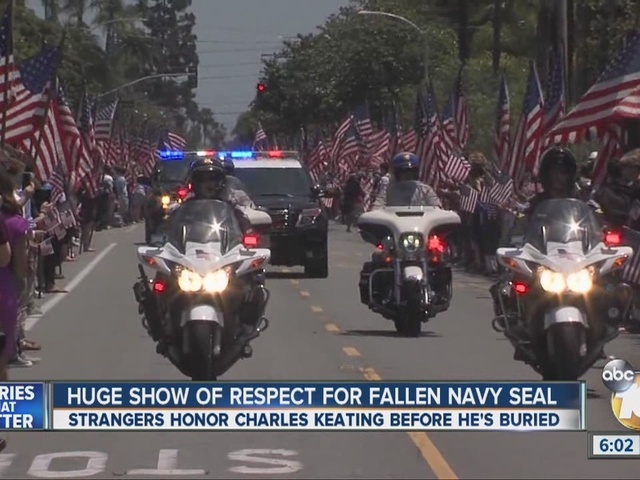 SAN DIEGO - A San Diego-based Navy SEAL killed in action in Iraq last week was laid to rest at Fort Rosecrans National Cemetery Friday following an enormous display of support from grateful members of the public. 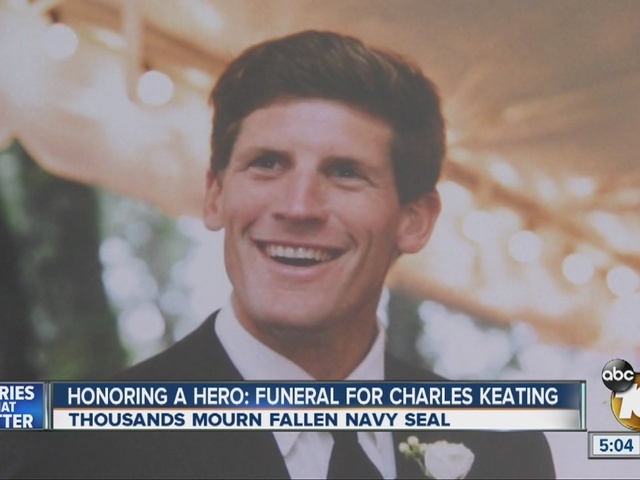 Petty Officer First Class Charles H. Keating IV, 31, was fatally shot in a May 3 battle with Islamic State forces in Tall Usquf, Iraq. According to the Navy, ISIS broke through the front lines north of the city of Mosul, and Keating's SEAL team and air support were called in to repel the attack. A funeral service was held at Sacred Heart Catholic Church in Coronado, after which a hearse carrying his body and a long procession of vehicles wound their way through the city and across the San Diego-Coronado Bay Bridge. Thousands of people -- including students let out from Coronado schools -- lined the route to pay tribute to the fallen SEAL. "I think it's very important to honor Charles Keating and his family," a Marine wife identified as Wendy told a local media outlet. "He left a legacy of honor and selfless service, which we can all emulate in our lives." Like most, Deborah Mariya never met Keating, but she wanted to honor him. "I am so grateful for this man who gave his life for me," Mariya said. "They [Navy SEALS] go into the riskiest places. They are the people that I have the most honor and respect for that I will never forget them." Elaine Allen came out with a Navy flag to represent Keating's branch of service. "This is the least I can do to pay tribute to somebody who gave his all," Allen said. Keating -- the grandson of financier Charles Keating from the 1980s savings and loan scandal -- grew up in Phoenix and was a star long-distance runner. His body was returned to Naval Base Coronado on Wednesday, and the Navy held a memorial service for him on Thursday. The Navy announced Keating will be posthumously promoted to Chief Petty Officer. He was eligible for promotion and had passed his chief advancement exam, according to the Navy Times. He was also awarded a Silver Star and Purple Heart in connection with last week's battle.